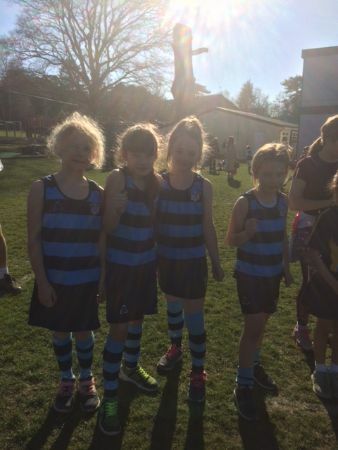 Fast, flat and fairly short (just under 1km), the race at Hilden Grange is a great little introduction to Cross Country competition and, with two of the four U8 girls sporting the hooped vests of Saint Ronan's for the first time, the warm, sunny February afternoon was perfect. At the sound of the starting siren, the sixty-strong field hurtled away from the start line as if their young lives depended upon it and, although the pace could not be maintained, the girls ran hard and responded well to the encouragement of the cheering supporters. First to cross the line was Lucienne SD, looking strong in a very credible sixth place. Jemima P and Minnie W (a completely new recruit, having only joined the school in January) finished 27th and 29th and little Phoebe D, in her first race, worked hard and crossed the line in 52nd place...with a big smile on her face! The girls' team came 6th of the 10 competing schools - a super achievement!